SMALL KUCING: Kafe Little B.U. One afternoon about a week ago, we went to the Barber. This round, I was real brave. Without being told, I climbed onto the chair. Guess, Tiger year brought out the Tiger in me. Jeng~jeng~jeng~ nice or not my short little Tiger tail? After going to the Barber, Mamarazzi "mengidam" Prawn Noodles pulak. There are many shops at Kota Damansara, so we just tembak one shop. Hmm...looks like they have a lot of makan-makan here leh. From Dimsum, Pau, Noodles to Rice. Papa gave some to me coz it's supposed to be good for cough and I was having cough. Eee...sour sour sweet sweet, not my cup of 'tea'. 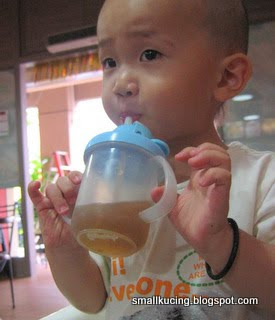 Hmm...I kena Mamarazzi scolding coz I always don't wanna drink "Leong Sui". 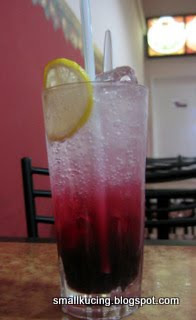 I preferred Ribena Soda Lemon(RM2-50). This was the first time I drink this.It was fabulous. Mamarazzi also love it. Then there was this Ang Moh Kor Kor who was chit-chatting with the Lady Boss. He came over and ask whether can let me have this nice jelly or not. After Papa and Mamarazzi said yes, he gave me this yummy jelly. Here comes the Prawn Mee. Eh...mana pigi Udang? Hehehehe...ada Udang di sebalik Mee. In fact Mamarazzi found two reasonably size Prawn under the noodle. Taste okay la. The soup was a bit salty due to being boiled from morning till afternoon. Boiled till "chutt mei". Papa had the Pan Mee. Nice or not? That one you'll have to ask Papa. The Lady Boss saw Mamarazzi snapping photos of the food and came over. Very friendly lady, sat with us during the meal and gave me one more jelly. Even provided Mamarazzi with a Menu and name card. Price wise for the food was affordable. Ranges from RM4 to RM6. Open daily from : 7.30a.m. to 11p.m. Closed on every 2nd & 4th Sunday of the month. Oh, kena botak again ya...hehe! 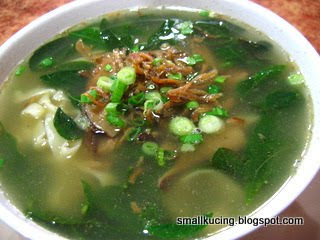 I love KL's pan mee , one the better ones in the country. What tail is that? Duck kah? Muahahahahahaha!!!! Wah...who the ang moh so nice gave you jelly? hot weather leh. This one is a very sweaty kucing loh. Wanted to botak him before CNY punya. But you know la...some times got some small minded people very pantang one. 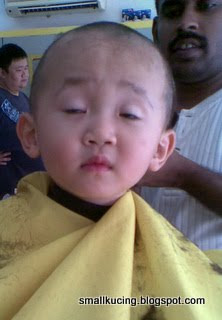 Say CNY see Botak very "soei". 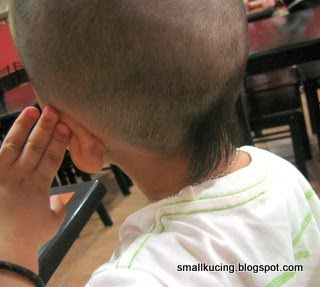 That's why Botak after CNY lo. Where you usually go for Pan Mee when you are in KL? botak with tail *hehe* cute!! Aiya, why cut until botak....but then not so hot leh! LOL! I have to go for a haircut already....hair almost reach my shoulder, the saloon owner asked me when want to cut!....ha ha ha! I like the tigger tail..so cute lor. Time to cut hair ler....later got mistaken as "Faye Chai" how? WAH!! Very fashion punya hair style ya. Ya, agree with you, Kota Damnsara there got a lot shops for food and also a lot boutiques too!! so the lady boss tot mama was going to review her food? got discount or not after the chat? hehehe.. The lady boss sure agak that you must be putting the photos in a blog, that's why she came over and do some PR with Mamarazzi. Advertisement opportunity leh, who don't want? Mostly I go to the makan :p.
Juan Or going to have tail or not? 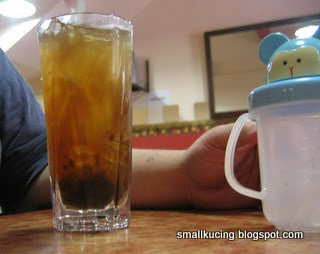 This blog kecil-mayung blog. Advertise also nobody sees la...kekeke..
ah soh, the lady boss must think u r either chui ling or axian doing food testing, hehehe! 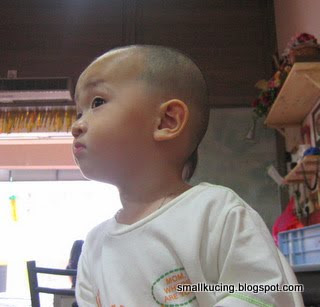 Whao... Joshua is going for a Shaolin monk hair style, definitely will look good with some Kung Fu posing! Haha... the lady might persumed you as a food critic! Aiyo...me mana famous like them. Me "infamous" got la :p.
How come your blog no movement one? So Ethel got botak or not :p? Yalor...i see everything under one roof. Price wise ok la. It's a few doors away from Kafe The Wok. Oh my..the food makes me drool lah. 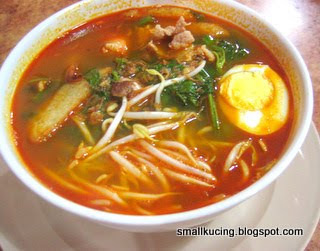 I like prawn mee and my Hubby likes pan mee..hehe. nice hairstyle. haha..with the tiger tail. Mamarazzi, Juan Or won't have the tail. Eh, I think your blog is getting very popular especially among mummy bloggers leh. As for the lady boss, I think she won't leave any stones unturned loh - doesn't matter whether the blog owner is big or small, famous or not famous, a publicity no matter how small is still business opportunity. Really? I love prawn mee and Hokkien Mee. Got Prawn Mee at Jakarta? I remember eating delicious Tar Tar Ribs and drink avacado Juice at a roadside stall there. Wah wah... Joshua's tiger tail very yeng wor!